The Lydian Chromatic Concept of Tonal Organization is a theory of Western music developed by composer George Russell during an unfortunate but highly productive bout of tuberculosis in 1945. Initially searching for the sonic origin of chords, Russell devised the Concept as a means of accounting for and remedying what he felt were inconvenient anomalies in the way that traditional Western theory explained the music he heard around him. In the 61 years since the Lydian Chromatic Concept was first published, there has been a delightful amount of controversy surrounding, and relatively little support for, Russell’s theoretical opus. It is my intent to shed some light on what I have found to be the virtue and methodical beauty of Russell’s concept within our contemporary musical environment. Bear with me; it’ll be a lot of fun. To make a brief explanatory voyage into my own background, I first became interested in the Lydian Chromatic Concept as a graduate student at the New England Conservatory of Music in Boston. While I had heard occasional mention of the Concept since high school (most notably by my jazz guru, David Schumacher, and in Robert Palmer’s liner notes to Kind of Blue), I began taking a close look at the theory in the class that Professor Ben Schwendener had inherited from Mr. Russell himself. My formal education prior to my years as an improvising trumpeter at the Conservatory was in philosophy, and I took a special interest in the works of Karl Popper and Thomas Kuhn in the Philosophy of Science. I brought the critical attitude I had exercised in philosophy school to Lydian Chromatic class, and I strove to find weaknesses in Russell’s concept while also examining the shortcomings of conventional theory. As I continued to question the Concept, I began to see the benefits to Russell’s approach in my thinking as an improviser and composer, and I gained an appreciation for the freedom, order, and power of explanation that I felt I was allowed. I have since studied the Concept privately with the benevolent Professor Schwendener in an attempt to gain a comprehensive grasp of Russell’s theory. The reason I find myself writing this story now is that I feel as though there is a value to the Lydian Chromatic Concept that remains largely misunderstood and underappreciated by musicians and theorists. Furthermore, I believe that George Russell only scratched the surface of the possibilities of his approach, and the further development and fine-tuning of the Concept will require the interest and scrutiny of my friends in the realm of modern music (that’s where you come in). Lastly, I should add that if the future explorations of my contemporaries should prove Russell’s Concept wholly worthless, I say thank God; let’s try to waste as little time as possible on any more convoluted nonsense. Speaking of convolution, as we go forward I will attempt to provide a summary of my thoughts with ample explanation of the principles of the Concept as to be properly informative, but not so informative as to turn this relatively innocuous article into a mind-numbingly elaborate dissertation on what I know of Russell’s ideas. I would encourage everyone who is theoretically inclined to, with an open mind and a critical attitude, read through Russell’s Lydian Chromatic Concept of Tonal Organization in order to arrive at an independent conclusion on the advantages and disadvantages to Russell’s approach. Before beginning to wade into the Lydian Chromatic Concept, let us first ask ourselves the fundamental question, “What the hell are we doing studying music theory in the first place?” To properly explore this inquiry, we might then ask, “What the hell are we doing studying theories in general?” It occurs to me that one great advantage to the inquisitive nature and analytical facility of our gigantic and enigmatic human brains is that if we can figure out why things work the way they work, we can figure out ways to manipulate those things to our advantage. The Germ Theory of Disease promoted by Agostino Bassi, Louis Pasteur, et al. helped convince medical practitioners that they could save lives by sterilizing their environments. The political theory of John Locke helped pave the way for the practical rule of law provided by the U.S. Constitution. Following this line of thought, we develop theories of music to figure out why music sounds the way that it sounds as a means of finding ways of writing good music. Let’s start with F as the tonic. The first non-F in the overtones of an F is C. C has a close relationship with F, and is highly consonant (hence, “perfect”). If we start on this C, the first non-C overtone is a G, a perfect fifth above C. This G is two degrees separated from the tonic F, but it still has a close relationship with F and a consonant sound over the F and the C. If we start on the G and find the first non-G overtone, we get D: three degrees from F, but still relatively close and highly consonant. Let’s add the fifth tone in F’s order of tonal gravity. So far we have F, C, G, D, and A. Rearranged, that gives us F, G, A, C, and D. These five tones make up the F major pentatonic scale, a highly consonant scale used frequently in the music of many cultures throughout the globe. Should we start this scale on the D, we also get the very popular minor pentatonic scale. If we include the next tone in F’s tonal gravity spectrum, E, we get a six-note scale resembling the major scale, but without the fourth degree. We might find this scale used in Western European folk music or by jazz students striving to avoid that vexatious “avoid” note on a Maj7 chord. Note that these are also all of the notes present in a fully voiced Maj13 chord. All right, here’s where people start losing their minds. If we ascend this order of tonal gravity a perfect fifth from E, we get a B natural, six degrees from the tonic F. Rearranged, these seven tones give us F, G, A, B, C, D, and E: the F Lydian scale. Hence, the “Lydian” in “Lydian Chromatic” and the reason Russell felt that Lydian, rather than Ionian, should be the mode at the root of his theory of music. 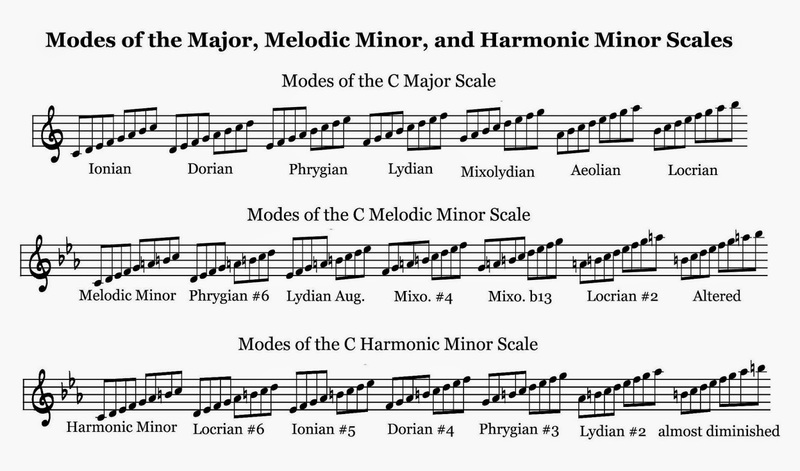 Due to the overtone-driven relationship between these seven tones and the tonic, Russell described the Lydian scale as being in unity with its tonic and felt as though it was the proper “parent scale” for what we know as the seven modes of the major scale: Lydian, Mixolydian, Aeolian, Locrian, Ionian, Dorian, and Phrygian. If you’re feeling like this whole #4 replacing the 4 situation is really rustling your jimmies, try playing an FMaj7 chord on the piano and experiment with the different tones in the order of tonal gravity as they become increasingly distant from the root. I think you’ll find that the B natural sounds like it has a closer relationship to the tonic than that feisty gremlin, the “avoid note.” All of this so far falls under the category of what Russell called “vertical tonal gravity” because we are dealing with the relationships between tones and a tonic pitch at one moment in time. Ok, that’s the majority of the technical explanatory aspect of our adventure through Lydian Chromatic world and the fundamental basis of the concept itself. I’ve got a little more to say on the subject of tonal gravity before we move on. Thanks for your patience. If F natural were Kevin Bacon, the aforementioned sixth degree of separation would be the end of the road for us. Alas, it is not, and we’ll carry on to the eighth tone in the order of tonal gravity. If you take a glance at my diagram of the order of tonal gravity from F outward, you’ll notice that after B, we skip a fifth and end up on C#, the #5, rather than F#. This hiccup in the tonal spectrum would be impossible to explain within the reasonable confines of this still fairly innocuous article, but I’ll summarize the oddity by saying that it is a compromise that must be made for the twelve-tone equal temperament that serves as the foundation of our Western harmonic language. To further clarify, Western music as we know it depends on making adjustments to the natural overtone series and dividing the octave into 12 equal parts so we can do fancy stuff like play in tune over multiple octaves. This leap in the tonal order accounts for this, and makes sense sonically in the long run. For now you’ll just have to trust me. After the #5, the rest of the order of tonal gravity continues up in fifths until we reach the most distant tone from the F tonic, F#. This completes the pitch spectrum and gives us all of what George Russell called the “Lydian Chromatic” scale. Following our example so far, the F Lydian Chromatic scale contains all 12 notes in the F chromatic scale, each of which has a distinct relationship, close to distant, from the tonic F to the 12th tone, F#. This concludes the wholly technical portion of our program. For further reading on the technical specifics of the Concept, read Russell’s book! I promise it’ll be a grand time. On the one hand, this merged duality makes the major scale very functionally useful, but this structure prevents Ionian from providing us with a unified center of organization in the same way the Lydian parent scale does. The moral of the story is that the Ionian mode occupies an important place in the Lydian Chromatic Concept, albeit a more subsidiary place than it occupies in conventional theory. Now we move on to the good stuff. 1. 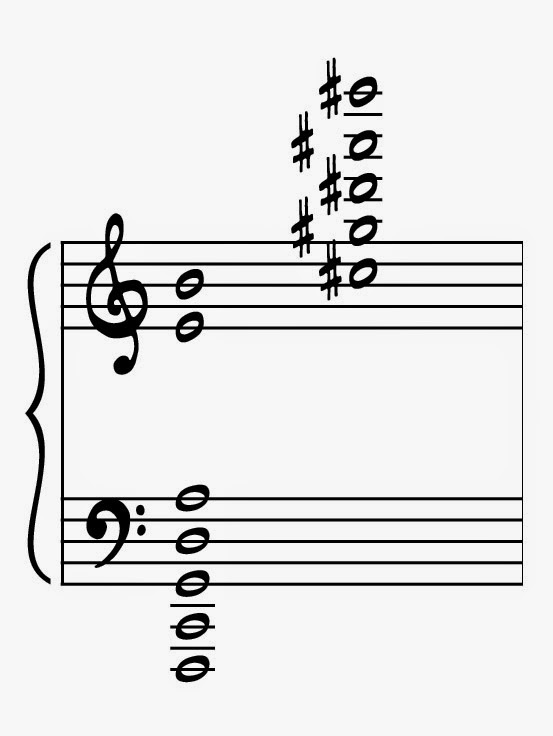 Why some notes should sound consonant but generally sound dissonant, or the cursed “avoid note” problem. Jazz educators the world over have been known to suggest to young improvisers that the Ionian mode is the scale that most closely corresponds to the ubiquitous Maj7 chord, but that the fourth degree should be used in passing or avoided altogether. The same is said of the minor sixth degree of the Aeolian mode over a minor chord. The explanation most often given is simply that these notes sound bad, or more elaborately that the fourth clashes with the third of the major chord, and the minor sixth clashes with the fifth of the minor chord. George Russell postulated that the reason for the dissonance is that C Ionian, for tonic example, is rooted in F Lydian, whereas a CMaj7 chord is rooted in C Lydian, a perfect fifth away. Similarly, A Aeolian is rooted in F Lydian, whereas an A minor or Amin7 chord is rooted in C Lydian, a perfect fifth away. Russell elaborated on the power and popularity of the Ionian and Aeolian modes, stating that by creating a melody using a mode whose parent scale is one fifth below the chord to which the melody resolves, the improviser or composer is implying a kind of plagal cadence that provides the music with a sense of forward motion towards the tonic at the root of the chord at hand (again, F[IV] to C[I]). This idea has to do with “horizontal tonal gravity” which deals with relationships between horizontal scales and an underlying harmonic progression in time. By using the fourth degree of the Ionian mode or the minor sixth degree of the Aeolian mode as a passing tone, the musician is establishing a resolution to a tonic. However, by holding these pitches over the major or minor chords with which they traditionally correspond, the musician is accessing the rather dissonant 11th tone of the tonal gravity spectrum of the chord at hand. In conclusion, provided that we all agree with Russell’s assessment (and we don’t), we can finally replace that sinister “avoid” note with the much friendlier “11 tone order/resolve to a tonic a fifth north of the parent scale” note. Well, I like the sound of it, anyway. 2. Why some notes should sound dissonant but sound consonant, or the “the blues scale always sounds good” dilemma. By organizing modes by their parent scale established in tonal gravity, it is easy to see the vertical and horizontal relationships between various chords and scales. Let’s take the example of a blues scale over a blues progression. The sound most closely associated with the dominant 7th chords that make up your everyday major blues is the Mixolydian mode. In Lydian Chromatic terms, C Mixolydian is the second mode of its parent scale, Bb Lydian. The C blues scale so often tastefully played over a C major blues is rooted in the sixth mode of its parent scale, Eb Lydian. Eb Lydian and Bb Lydian are a perfect fifth apart in the same way that F Lydian and C Lydian are a fifth apart. Just as C Ionian (F Lydian) resolves to CMaj7 (C Lydian) in the previous anomaly, the C blues scale (Eb Lydian) provides a kind of plagal cadence to C7 (Bb Lydian). As with the major scale, this idea deals with horizontal tonal gravity, and the tonal relationship makes for a consonant and tonic-seeking sound. Note that the same resolution could be found in an example where the C blues scale is played over a CMaj7 chord, except that the resolution would be three fifths from Eb Lydian to C Lydian, rather than just one – a triple plagal cadence… or something like that. There are many other practical examples that could be used to illustrate this anomaly in conventional theory, but I think this common blues scale example will be sufficient for now. Throughout my discussion of sonic anomalies I have referenced the idea that the sound of a resolving cadence is established when a mode from one parent scale resolves to another parent scale x number of fifths away, i.e. F Lydian to C Lydian, Eb Lydian to Bb Lydian, Eb Lydian to C Lydian. Coming from conventional jazz theory, it seems intuitive to us that a standard ii-V-I progression would contain three chords that all belong to the same key or parent scale. Using C Major as an example, we have Dmin7 (ii of C) – G7 (V of C) – and C Major (I of C). 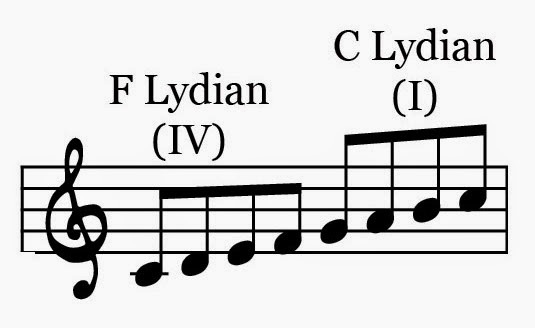 In Lydian Chromatic terms, a ii-V-I consists of one parent scale resolving to another parent scale one fifth away: Dmin7 (vi of F Lydian) – G7 (II of F Lydian) – C Major (I of C Lydian). In addition to the ever-important harmonic rhythm and the motion of voices within the chords, Russell’s perspective gives an explanation as to the forward-moving sound of such a cadential resolution. The same could be said of another common example: Fmin7 (vi of Ab) – Bb7 (II of Ab) – C Major (I of C), except that here, the resolution from parent scale (Ab) to parent scale (C) extends over not one but four fifths (Ab - Eb - Bb - F - C). In retrospect it seems to me unusual that conventional theory wouldn’t account for the sound of these cadential relationships, but I suspect many who read this will think it crazy of me to treat a ii-V-I as consisting of two separate parent scales. For this reason I’ve decided to include what I think to be an oddity as an addendum rather than an anomaly in the system. One final note on conventional theory: Due to the fact that the Lydian Chromatic Concept deals with sonic relationships rather than musical conventions, I have found many unconventional or non-Western pieces of music relatively easy to explain in Lydian Chromatic terms, but difficult to explain using traditional Western theory. While many jazz standards and classical pieces can be as effectively analyzed using conventional theory as the Lydian Chromatic Concept, I have found it highly effective and enlightening to use the Concept when dealing with the music of Charles Ives, Eric Dolphy, Arnold Schoenberg, Ornette Coleman, Boban Markovic, Mulatu Astatke, Les Claypool, and others. In a post-20th century world where accessible recording technology and advanced communication systems are, to my great excitement, continually bringing music and musicians together from so many cultures across the globe, I find it helpful to have access to a theoretical approach that remains largely free from adherence to particular stylistic conventions. One great advantage to approaching composition (spontaneous or premeditated) from a Lydian Chromatic perspective is that the concept of tonal gravity allows for the calculated manipulation of parent scales in order to arrive at particular modalities of varying degrees and styles of dissonance. That is, by replacing select pitches in lower tonal orders with pitches in higher tonal orders, the musician has a great deal of control over a seemingly endless array of modal colors. This allows for a great deal of sonic freedom and also provides us with a practical and user-friendly system of modal organization. These seven modes are traditionally referred to as the modes of the harmonic minor scale, and have also been a fairly common sound in jazz since the ‘50’s and a big part of Eastern European and Northern African music since time immemorial. I use the aforementioned parent scales as examples because they illustrate the way in which we can use the 7th, 8th, and 9th tones in the order of tonal gravity to construct some common sounds. However, be aware that this principle can also be used to come up with any number of satisfyingly unusual parent scales and their modes. Anything goes, but two other common examples include: whole tone (a hexatonic Lydian with a #5 and #6 [the 8th and 10th tones in the order]) and diminished (an octatonic Lydian with a #5 [8th tone], b3 [9th tone], and a n4 [11th tone]). One uncommon example might be a heptatonic Lydian with a #2 [9th tone] and a #6 [10th tone]. Russell referred to any unconventional scale of any number of notes as an “official scale.” I like this term because it’s as confusing as it is open-ended and accepting. From here, if I were looking for an Ionianish version of this color to fit a major or augmented chord, I might use the fifth mode of this Lydian parent scale: Ionian #2 #5. If I were looking for a spooky horizontal sound to accompany a minor chord, I could try the third mode: Harmonic minor with a #4. Having a perspective on the relationship between various parent scales also gives the wily improviser options to superimpose certain modes over relatively unrelated chords. In jazz pedagogy, one product of this idea is known as “side-stepping,” and it most often involves playing a melody a half step above where it would normally be played, and then resolving the melody back to the consonant chord at hand. Looking at chords and melodies in terms of their respective parent scales, the improviser can experiment with any combination of modal colors, creating melodies that may seem to pull inward towards the tonic of a chord of a different key, or float above the progression in a state of defiant polytonality. Tonal gravity and the circle of fifths give us a handle on the nature of the relationships between two or more modes, and why these relationships have certain musical effects. In addition to providing us with a way of approaching the vertical relationships between pitches, chords, and modes, another great advantage to the Lydian Chromatic Concept is that it gives the composer a clear perspective of the relationships between different chords in time. 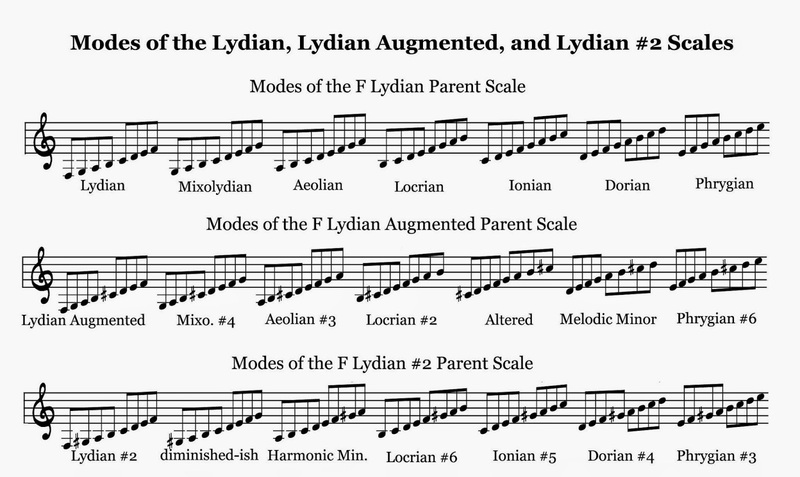 As was alluded to in previous sections, the Concept looks at chords as being representations of modes, and thus each chord can be found to belong to a Lydian parent scale. Looking at the harmony of a piece of music in terms of the relationships between various parent scales in time allows for an ease in analysis and exploration of unconventional and pan-tonal chord progressions. This idea has compositional and analytical implications that far outweigh the little space I’m able to provide for it here, but an example of this kind of horizontal harmonic analysis can be found back in my brief discussion of chord progressions in the “Two related notes on anomalies…” section. At the end of the day, our job as musical artists is to use vibrations in the air to convey ideas and emotion, and our ears and imaginations are our greatest tools. The Lydian Chromatic Concept simply provides a clear view of the vast sea of sonic options at our disposal, which we may choose to use or ignore. There are no wrong notes! Tonal gravity eliminates the need for antiquated and oppressive dualistic distinctions like “right” or “wrong” in music. Instead, we can look at tonal relationships on a spectrum from consonant to dissonant. Perhaps one might find it useful to use “right” and “wrong” to illustrate compositional concepts to young improvisers; however, only the crankiest among us would still find it helpful to describe the music of Sam Rivers or Woody Shaw as being peppered with “wrong notes.” I suppose we could go by the old adage, “You have to learn the rules so you can break the rules,” and argue that avant-minded composers and improvisers are expert rule breakers. But who needs rules in the first place? I say rules be damned! Let the impotent jazz police cry themselves to sleep as we venture headlong into the sonic unknown, looking back at our forbears with a new sense of reverence and admiration. Let us learn everything we can about how and why our music sounds the way that it sounds so that we can be honest composers, building on the tradition and inventing anew in order to reflect on our own place in time and space. Let us take a new liberated dissonance and allow it freedom to stand alongside consonance towards a common goal: the cultural and intellectual evolution of mankind! Ok, I may have gotten a little worked up there. In summary, George Russell’s Lydian Chromatic Concept gives us a relatively objective way to view the relationships between tonal colors in a 12 tone equal tempered system without strict adherence to tradition or stylistic convention. The Concept makes no comment on aesthetics or taste, so it is up to us, the artists, to use what knowledge we can gain and, most importantly, our intuition, to find ways of saying what we have to say. If we can learn anything from the history of science and philosophical thought, we will someday find more practical and accurate ways to approach music theory. However, in order to reach new heights it is important to take the time to explore different contemporary theoretical paradigms to glean from them what is helpful and what is not. I have only scratched the surface of the explanatory scope, sonic implications, and inherent philosophy of the Lydian Chromatic Concept, but I hope to spur some small amount of interest in Russell’s ideas, or give an answer to those who wonder why anybody has bothered to study this stuff in the first place. At best, somebody out there will use a newfound interest or an utter hatred for the Concept as fuel for some great new music. Regardless as to the future of the theory itself, those familiar with the compositions and improvisations of Miles Davis, Eric Dolphy, Art Farmer, David Baker, Ben Schwendener, and of course George Russell himself have evidence of the way the Lydian Chromatic Concept has served as a catalyst for great music destined to stand the test of time. I told you we’d have a lot of fun. Thanks for listening. Check out Russell’s book, and remember that it is only the tip of the Lydian Chromatic iceberg. Do your best to prove me wrong. I look forward to the fruits of humanity’s continuing cultural, intellectual, and philosophical evolution. That music was bebop and other styles of jazz being played in New York in the 1940’s and ‘50’s. While the Lydian Chromatic Concept is a theory of all Western music and not only American jazz, I suspect the fact that improvised music requires each performer to be a spontaneous composer contributed largely to bringing these anomalies in conventional theory to light. This is a story for another time. It is important to note that one can eat well without studying nutrition, one can build a trebuchet without studying physics, and one can write amazing music without any knowledge of music theory. Theories are not always mandatory in practical matters, but they help by taking the often time consuming guesswork out of the process. For this reason I specify that it is a theory of Western music, though the fundamental implications could be applied to any style of music the world over. I find myself consistently aggravated by the term “avoid note,” and one thing I like about the Lydian Chromatic Concept is that it eliminates the need for such a ridiculous concept. I use it here for illustration, and I promise never to use it again. This joke will quickly become antiquated, and is likely to be excluded from future editions. I lied about never using the term again. Again, it’s only for clarity and explanation. I should add that the sound of the blues has a rich and important tradition, and much could be said about its West African origins, its cultural significance, and its place at the root of American popular music. This is a story for another time, and for now I’ll have to stick to a purely practical theoretical overview. Please note that as we get into more unusual modes, I may fabricate some mode names based on what seems logical. I didn’t know the number for the Bureau of Official Unconventional Mode Names, and I figure a mode by any other name should sound as sweet.